Go to the InLoox contact management by clicking on People on the InLoox now or InLoox PM tab. The address book view provides some helpful features on the Start tab. 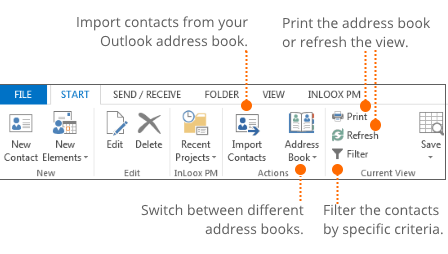 By using this feature you can import contacts from your Outlook address book to your InLoox address book. 1. Click on Import Contacts on the Start tab. 2. Your Outlook address book pops-up and you can select the needed contacts by double-clicking. 3. When you are finished, click on OK.
4. All data that is connected to the selected contacts will be transferred automatically to InLoox. Now you can access the imported contacts from your InLoox address book. You can search your contacts by using individual filters. This is very helpful when you are searching for a specific contact without remembering the full name. Therefore click on the Filter icon in the Start ribbon. A new window will open where you can edit the filter. 1. Click on the blue text (here „Display Name”), to filter by a specific criteria. You can use the following criteria: Display Address, Display Name, Email, Mobile, and Telephone. 2. Choose a condition by clicking on the green text (here „Begins with”). You can use many different conditions, like for example “Begins with”, “Equals”, “Contains” or “Ends with”. 3. Enter a value for the chosen criteria (here “K”), by clicking on the grey text “<enter a value>”. 4. For adding more filter criteria click on the plus icon next to the red „And“. Afterwards, edit the logical operator that is used for connecting several criteria, by clicking on the red “And”. Choose between: and, or, not and, not or. 5. Afterwards, click on Ok to scan your contacts with your individual filter. The results will be shown. 6. To edit the filter click on Edit filter below your results. To remove the filter click on the “X”-icon below your results. In the right corner above your contacts you will find the feature Search contacts. With this feature you can easily search your contacts without creating a filter. Just enter some contact information to search for a specific person or e.g. for all contacts from San Francisco. 1. Enter some contact information in the field Search contacts and press enter or click on the loupe icon. 2. The results will be shown immediately. To exit the search click on the “X”-icon next to the search field. Features in the address book view • Copyright 1999-2019 © InLoox, Inc. All rights reserved.